Hello Everyone! Since my last blog post did get some attention toward my Kickstarter campaign, I thought I’d come back and try again, since we’re trying again with a new Kickstarter Campaign! The goal of the last campaign was a bit too big and I wasn’t able to attain that goal. However, we have now reached the goal for the new campaign and if all continues to go well with it – we’ll successfully take over 52Teas! As those of you who have read my past reviews are probably aware, I’m a bit of tea freak and this acquisition is a DREAM coming true for me. I hope that you’ll all support me and help me make this dream a reality! While we have reached the goal – we still could really use your help in reaching the stretch goals of the campaign. We want a new website and we need some other equipment and the extra boost of those stretch goals will help make those things happen for me. So PLEASE – visit my Kickstarter campaign and contribute what you can to help us! I’ll reward you with some awesome tea! And really, is there a better reward than tea? I received a tray of this snack in my December Graze Box. I decided that iced tea seemed the ideal choice for this snack. And since it’s a Thai inspired snack, I went with a lime flavored tea, specifically, this Key Lime Cheesecake flavored Iced Tea from Southern Boy Teas! The tangy lime and cream cheese notes played perfectly with the spicy-sweet sauce in this snack. YUM! After taking my first bite of this My Thai Snack from Graze, I immediately clicked on the “Love” button on the Graze website. This snack is the perfect snack for me. The whole snack tray is just 84 calories, too! The baked soy ‘bites’ are little rounds that are thicker than a chip – they remind me of “tater tot rounds” which are about a third as tall as a typical tater tot. These are about the same size as those tater tot rounds. They are crispy and have a light texture to them. They are lightly salty, and really, that’s mostly all you taste. You get a little bit of salt and a whole lot of crunch … but no extraneous flavors to interfere with the delightful taste of the sweet and spicy sauce. Then again, I’m not eating them without the sauce … so I can’t say with certainty that if I were to focus on the flavor of these soy bites that there wouldn’t be more that I could taste from them. The sauce is just too amazing to not dip the soy bite into! The sauce looks a bit like a jelly. It is sweet and spicy, and there is a delicious balance between these two contrasting notes. The sweet tastes a bit like a sugared sweetness … not really like honey or other sweetener. The spiciness comes from the chili pepper (you can see the flakes throughout the sauce). There is a slight vinegar-y tang to the sauce, and perhaps just a hint of garlic. But mostly, what I taste is the sweetness and the spiciness of this sauce … and I love it. I want a jar of this stuff. LOVE! This just may be my favorite snack that I’ve tried from Graze yet. I’d be thrilled if they sent this my way every single month. Oh! And I didn’t let the extra sauce go to waste, either. We had some chips in the pantry – Original Pringles – which are not as healthy a choice as the soy bites and did add to the calorie count of the snack (probably more calories than I care to know! ), but I didn’t want to waste a single bit of this sauce. I love it. The chips tasted great with the sauce too. 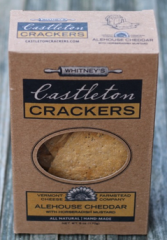 Castleton Crackers of Vermont never ceases to amaze us with their delicious new crackers. The latest out of Vermont is their Alehouse Cheddar made with local craft ale, cheddar cheese and very mild horseradish mustard. All natural, and hand-made in Vermont. I received a full sized box of these crackers in my November Knoshbox. I chose a mild white tea go to with these crackers. I wanted something mild because I didn’t want anything to interfere with some of the more nuanced flavors of the cracker and I wanted something cooling to soften the effect of the horseradish mustard. The horseradish is mild, as the description above states, but, it does build a little bit and the white tea helped to cleanse the palate in between crackers. I chose this China Mutan White Tea from Mark T. Wendell – and the crackers and tea made for a lovely tea time! I’ve tried a few different Castleton Crackers since I’ve started this blog. The first package that I tried were the Windham Wheat crackers, and then I tried the Rutland Rye and the Sesame Graham crackers. Now we have the Alehouse Cheddar Crackers and these are reaffirming for me why I love this company’s crackers so much. Not only are they a handcrafted cracker that are made in small batches and obviously broken by hand rather than crafted in an assembly line in a factory somewhere, but the flavor of these crackers just cannot be beat! You just can’t get this kind of taste in a commercially manufactured cracker. The crackers not only look like they were made in someone’s home kitchen, but they taste like it too! You can taste the love in them. As much as I loved the salty and sweet contrasts of the aforementioned Graham Crackers that I tried most recently from this company, I think that these Alehouse Cheddar might be my new favorite. It’s surprising to me, really, because I’m not a big fan of alcohol, as I’ve mentioned before, but, I love the way the flavors are represented in these crackers. I taste the cheddar, but it doesn’t hit me over the head with cheesy flavor. I taste notes of the ale, but the most intriguing note that captures my interest is the horseradish. It’s not an overwhelming flavor … it’s in balance with the other notes in the cracker. But, it is a flavor that builds and after I’ve eaten a couple of crackers my mouth is pleasantly warm and I can feel that enjoyable “burn” in the top of my throat and even that hint of a sting near my eyes and nasal passages that one gets from horseradish. I love horseradish, so these notes were certainly a welcome surprise to this cracker. I like that it starts out subtle but the heat builds. I really like these crackers. Then again, I’ve really enjoyed all the different crackers I’ve tried from this company … but I think that the unique layers of flavor in this cracker might just make it my favorite! They have the cheese, they’ve got some ale flavor, and some horseradish mustard … all that you need is a cup of tea! My Love With Food Box is Back! A few months ago, I stopped my subscription with Love with Food mostly because I had fallen so far behind on my product reviews and I didn’t need so many more products coming in … putting me even further behind. But now that I’m getting caught up, this was a box I wanted to reinstate right away because I missed it. And for good reason. 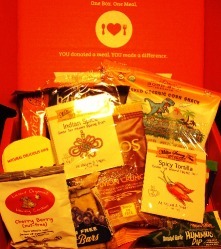 I had forgotten just how many treasures Love With Food packs into each and every monthly tasting box! This month’s box features a guest curator: Chef Ming Tsai. I was excited to see what Ming Tsai would put in this month’s box … and there is quite a huge array of goodies in the box this month. The first two items that I’m really excited about are two “tea bags” of sipping broth from Millie’s Savory Teas. 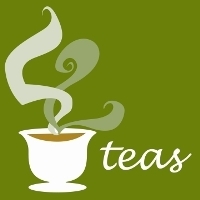 I previously tried one of these teas/broths and while it wasn’t my favorite “tea” … as a broth, I found it tasty. 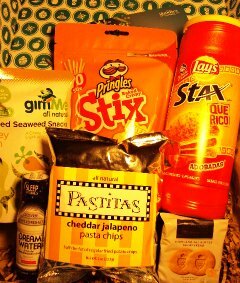 In this month’s Love With Food box, there are two flavors that I haven’t yet tried so I look forward to sampling those. I’m also really excited to try the Bruschetta Dipin Dip! I love Bruschetta … and I’m looking forward to trying this! This month’s box also featured a bag of Crunchy Cinnamon Apple Chips from barefruit – a product I’ve previously reviewed, so I won’t be reviewing it again, but I think this is a great opportunity to pass along a healthier “chip” choice to my youngest daughter who recently pledged to start eating healthy. Also in this month’s box: A tube of Wild Garden Roasted Garlic Hummus Dip (I previously reviewed the Traditional Hummus Dip), A Gluten Free Blueberry Fruit Bar from BettyLou’s, Cinnamon Crunch from Cosmos Creations, Cherry Berry Raw Cookie from Licious Organics, and Fruit Snacks from YumEarth Organics. And in case you lost count … that’s TEN items in this month’s box! Woot! And given the sheer number of items in the box, it surprises me that there’s only one that I’ve previously tried! It looks like I picked the right month to start my Love With Food subscription back up! If you’re interested in subscribing, you can learn more here. rich. refreshing. 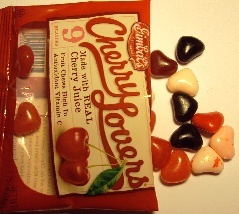 naturally flavored with just a hint of tartness. taste the burst of billions of bubbles in our sparkling black raspberry flavored fruitwater®. it’s a little tart, a little sweet. all delicious. just like you. 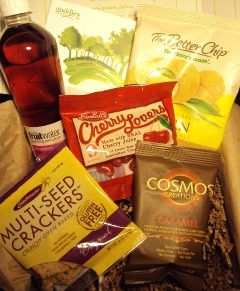 I received a bottle of fruitwater in my July Goodies Box. So, the first thing that I check out when I get a drink like this in one of my tasting boxes is the label. Does it contain Aspartame? No, this product doesn’t, it contains Sucralose … which is still an artificial sweetener but, it isn’t as dangerous to me personally as Aspartame is. I’m quite allergic to Aspartame, when I consume it, I am pretty much OUT for the day. I start feeling sick, like I’m going to vomit, and I feel dizzy – well, dizzier than usual! – and I need to lay down. I’m just NOT good after I consume Aspartame. But, Sucralose doesn’t affect me that way, so I felt safe cracking open this bottle of fruitwater. Unfortunately … it still tastes very artificially sweetened. Icky! Once my palate can get past that yucky artificial taste, I can taste the berry flavor. This … on it’s own, beyond the artificial sweetened taste is alright … I think this would actually be something I could drink if it had been sweetened with something like cane sugar or even agave nectar. As it is, though, I can’t drink much of this, because my palate is just telling me NO! I suppose I’ll give the rest of this to my husband … he’ll probably love it. Didn’t like it enough to even drink half a bottle of it. The berry flavor would be nice if it was sweetened with something not artificial. For those who don’t mind that “diet-y” chemical-y taste and aftertaste, I can see the appeal of a drink like this, but me … I’ll stick with my tea, thanks!